I mentioned in my last post that I have a new fondness for International Delight creamers. I have so many recipe ideas swirling in my head that they have been keeping me up at night. I just can’t wait to make all of them! When I spotted the Almond Joy creamer in the grocery store I immediately grabbed it and knew that I had to do some fun things with it. I mean who doesn’t love chocolate, coconut, and almonds? Then you put them together and they are heaven! Well, unless you are like my hubby and don’t like coconut. Which I just can not understand. These cookies are so soft and delicious! Yum! 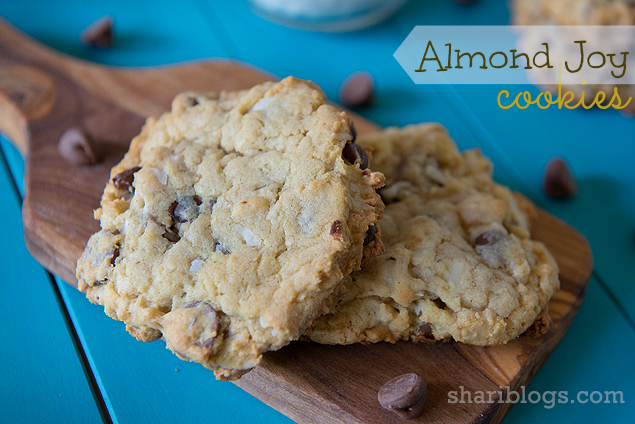 You can adjust the amounts of chocolate chips, coconut and almonds to your liking too. I say the more the merrier. In a large mixing bowl, beat together the butter and shortening. Add the sugars and beat until creamy. Add the egg, creamer, and vanilla, Mix well. Mix in the flour, baking soda, and salt just until mixed. 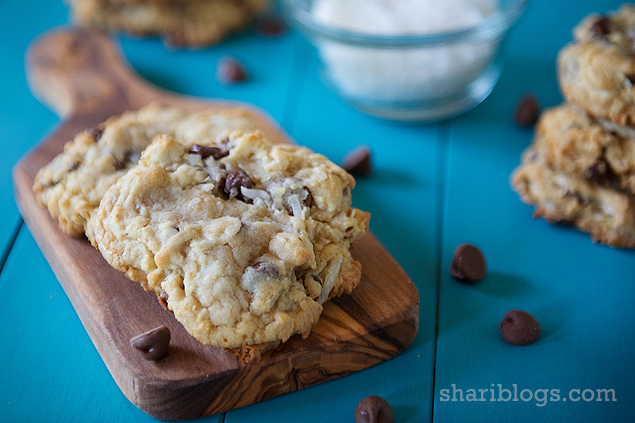 Fold in the chocolate chips, coconut, and almond slivers with a spatula. Scoop ¼ cup of dough and place on a parchment lined cookie sheet. Bake at 350 for about 12 minutes (baking time may vary). * I prefer my cookies slightly underbaked so they are nice and soft. 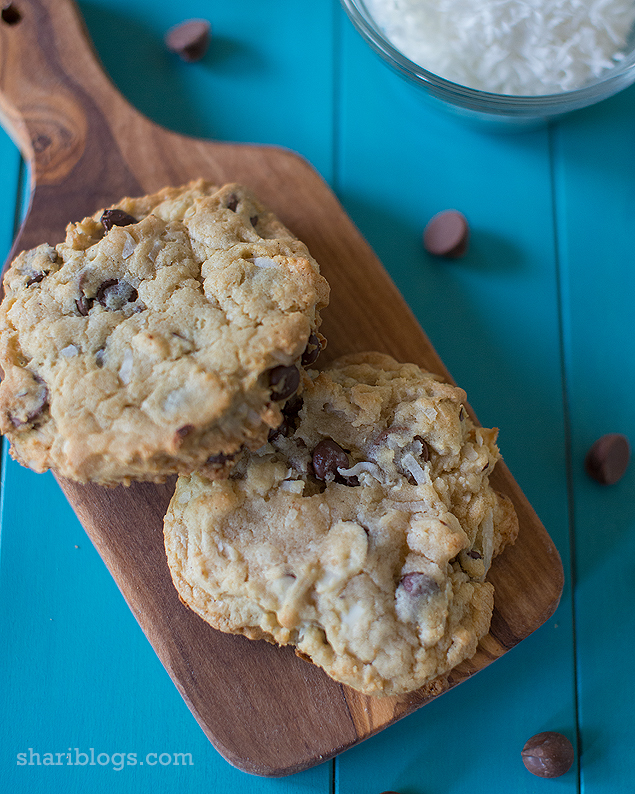 If you prefer a crunchier cookie, then add 2-3 minutes to baking time. 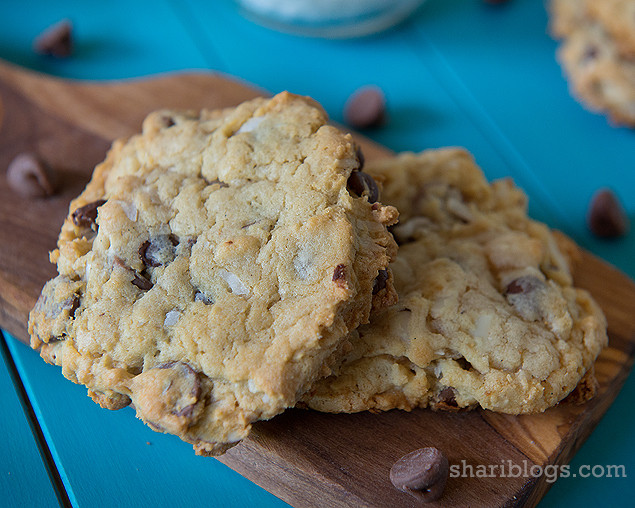 * I use a stand mixer for these as it makes baking life so much easier! 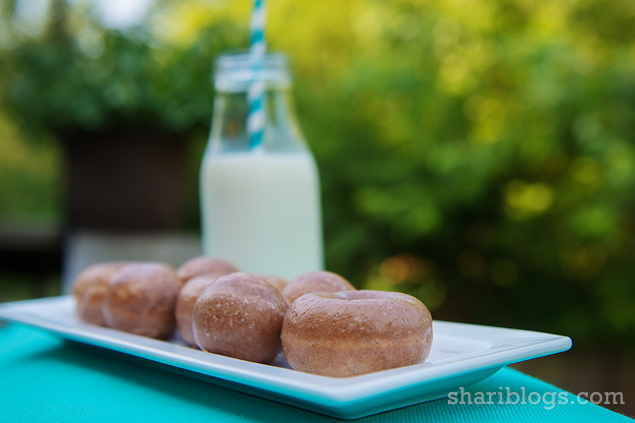 I have to tell you that I am totally addicted to homemade donuts. Tons of recipe ideas are always swirling around in my head. When I made these, my kids went nuts. Noah ate nearly 3/4 of them himself. They are soooo good. I will definitely be making these again and again. You know how even the donuts from those famous places tend to get hard or stale the next day? Not these. They were still fresh the next morning and quickly gobbled up! Not to mention super easy to make! I keep giggling while I type up this post because my husband made the comment at dinner the other night that I add cinnamon to everything. Not true, but I do have to admit that I LOVE cinnamon in a lot of things. 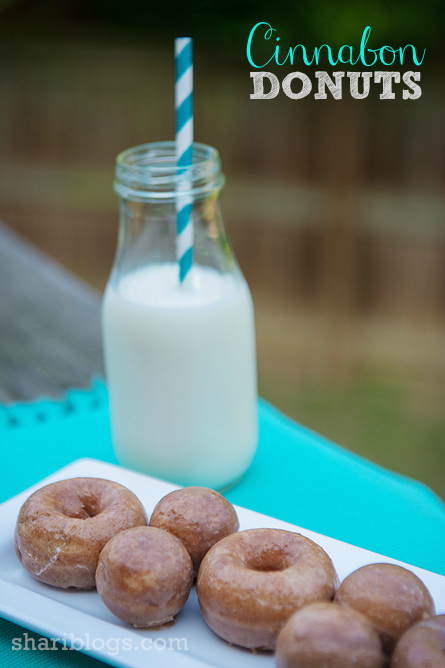 An example would be these Cinnabon Donuts. They are nothing short of A-M-A-Z-I-N-G!! I also have to admit to my new obsession with International Delight Coffee Creamers. I have been creating all kinds of yummy treats with them (coming to the blog soon). They come in a wide variety of flavors which makes the possibilities nearly endless! One of the things that makes this recipe so easy is that the base is a boxed cake mix. I know there are those that are shaking their head at me, but I absolutely LOVE Pillsbury boxed mixes. They are easy, always turn out perfectly and taste like homemade to me. You can use any boxed mix you want, but I HIGHLY recommend the Pillsbury Moist Supreme mixes. They never fail me! In a medium mixing bowl, mix together all of the donut ingredients. Transfer your dough mix into a gallon sized freezer bag. Snip a hole in the corner of the bag. Pipe dough into your donut pan. Bake for 8 minutes or until the tops spring back when you touch them. Let the donuts cool in the pan before glazing. In a small bowl, stir together the glaze ingredients until sugar is completely dissolved. Use immediately to glaze donuts. 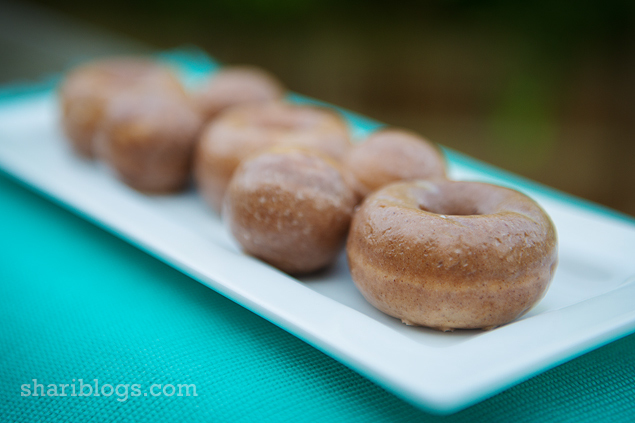 Dip each donut in glaze and place on a wire rack to set. Do you need a Donut maker or Donut pan? You can pick them up from Amazon using the links below. I used the Babycakes Donut Maker and Cake Pop Makers for these. They are AWESOME! I am dying to try some of their other makers now! Like I have mentioned before, I am going to be posting recipes that my family loves. I don’t know about you, but I have been to many “family friendly” recipe blogs before and there was nothing my kids would ever let cross their lips. I want this to be a place where you can come and know that anything on this blog will be a hit in your house! 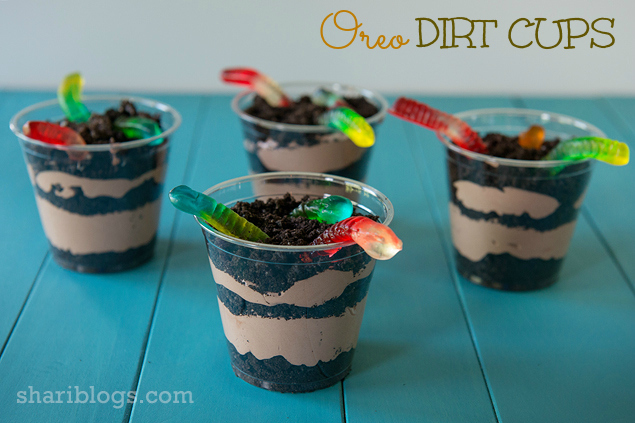 Yes, Dirt Cups have been around for a long time and are easy to make, but I think they deserve their own spotlight. Don’t you? 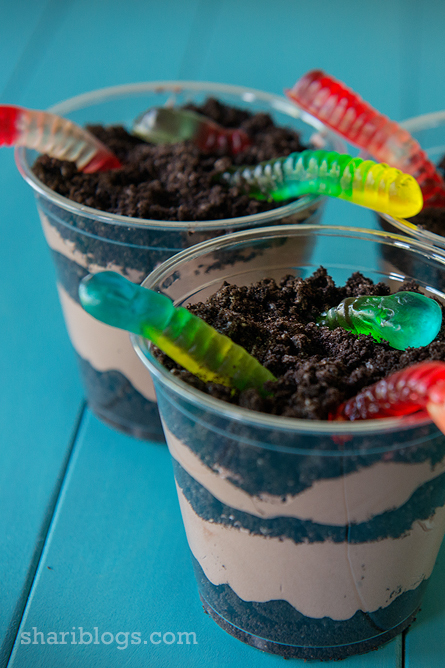 What is not to love about chocolate pudding sandwiched between layers of crushed Oreo cookies and topped with sweet gummy worms? Pour the milk into a mixing bowl and add the pudding mix. Let pudding stand for five minutes. Stir whipped topping into the pudding very gently until it is all the same color. Place about 1 Tablespoon of the crushed cookies into the bottom of each cup. Then add a 2 Tablespoons of pudding to each cup. Then repeat another layer of cookies, then pudding, and then cookies. 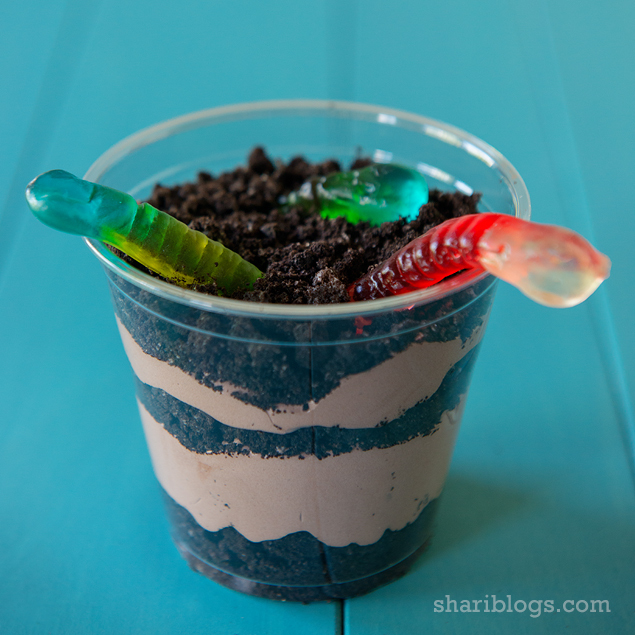 Finish up by adding 2 gummy worms cut in half to the top of each of the cups. Put cups into the refrigerator for about one hour to chill them. * I usually wait and add the gummy worms when I am ready to serve, rather than put in the refrigerator. Do you get the munchies for something sweet? I have gotten in the habit of needing a little bite of sweetness every evening. It doesn’t have to be anything big. These are perfect to grab and take care of my craving. My husband and daughter request these pretty frequently. Beat the egg whites and water together in a large bowl. Next add in the pecans and stir to coat. Whisk together the sugar, salt, and cinnamon. 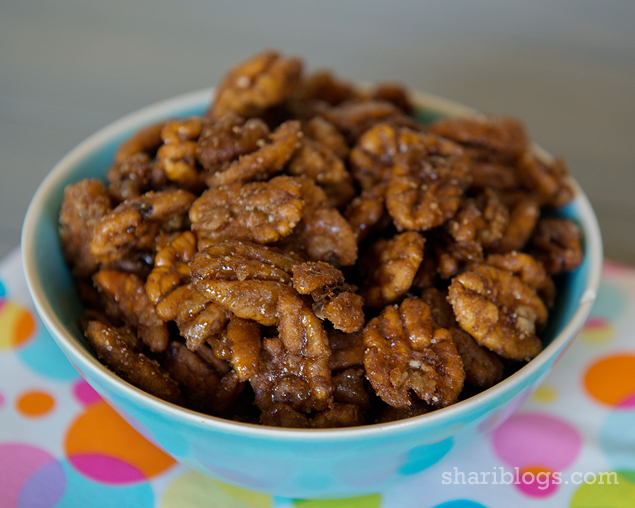 Then pour over the pecans. Stir to coat. 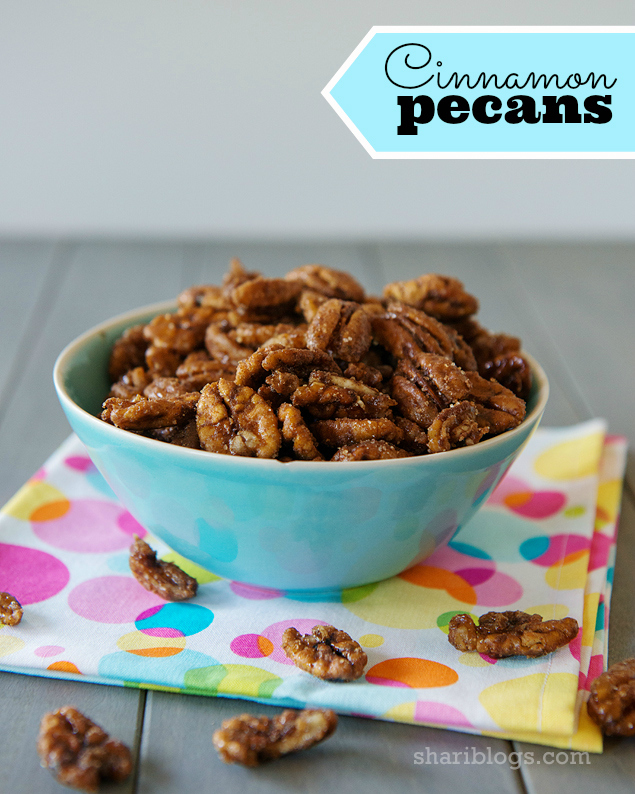 Spread pecans on a baking sheet that has been lined with parchment paper. Bake for one hour, being sure to stir every 15 minutes. Recipe adapted from Kevin and Amanda. My son Noah is a chocolate-a-holic. Dark chocolate, milk chocolate, semi-sweet, it doesn’t matter. He loves all of it. I think it’s kind of funny because I am not a big chocolate fan. I will admit that (thanks to him) I do eat more chocolate things now than I did before. I made this chocolate cake for a recent get together with friends and it was a HUGE hit. I think the whole thing was gone in record time! 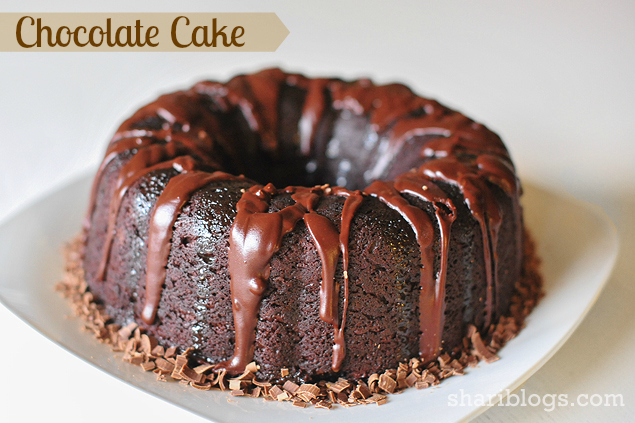 The satin chocolate glaze is to die for and could be used on so many other things besides this cake. I already have several other ideas in mind for this glaze too! In a large bowl, mix together the cake and pudding mixes, sour cream, oil, beaten eggs and water. Stir in the chocolate chips and pour batter into a well greased 12 cup bundt pan. Bake for 50-55 minutes, or until top is springy to the touch and a wooden toothpick inserted comes out clean. Cool cake thoroughly in pan at least an hour and a half before inverting onto a plate. If desired, dust the cake with powered sugar. In a double broiler over hot, but not boiling water, combine chocolate chips, butter, and corn syrup. Stir until chips are melted and mixture is smooth, then add vanilla. Spread warm glaze over top of cooled cake, letting it drizzle down the sides. I have an amazing recipe for you today. 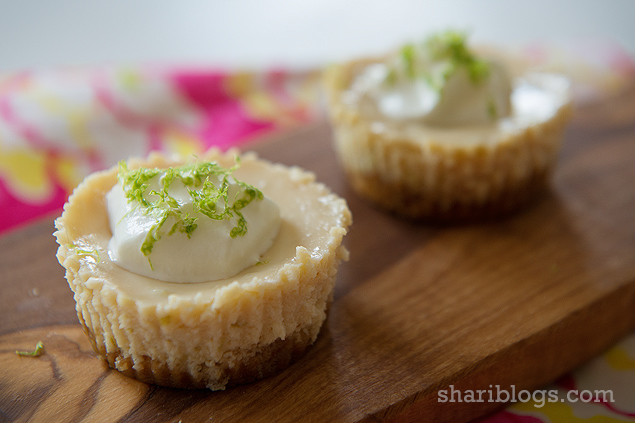 Key Lime Pie is one of my favorite desserts. I love how light and refreshing it is. This recipe has just the right amount of tartness to it. I can see us making this one a lot, especially on hot summer days. Crush the graham crackers in a food processor. Add sugar and butter and mix into the crushed graham crackers. Press 1 Tablespoon graham cracker mixture into the bottom of a tart pan or cupcake liner. Bake for 5 minutes to harden the crust. In a separate bowl, mix together egg whites, condensed milk, lime juice, lime zest, and greek yogurt. Mix well until smooth. Fill the tart pans or cupcake liners about ¾ full with the mixture. Bake for 12-14 minutes and then let cool. 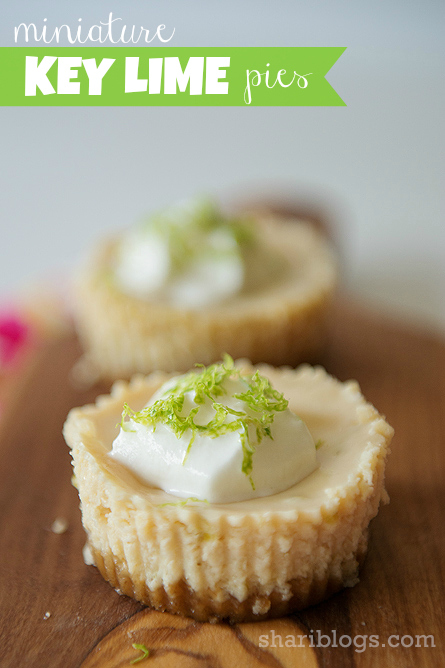 Top with whip cream, lime zest or other garnish. Store in the refrigerator. *Adapted from original recipe found here.